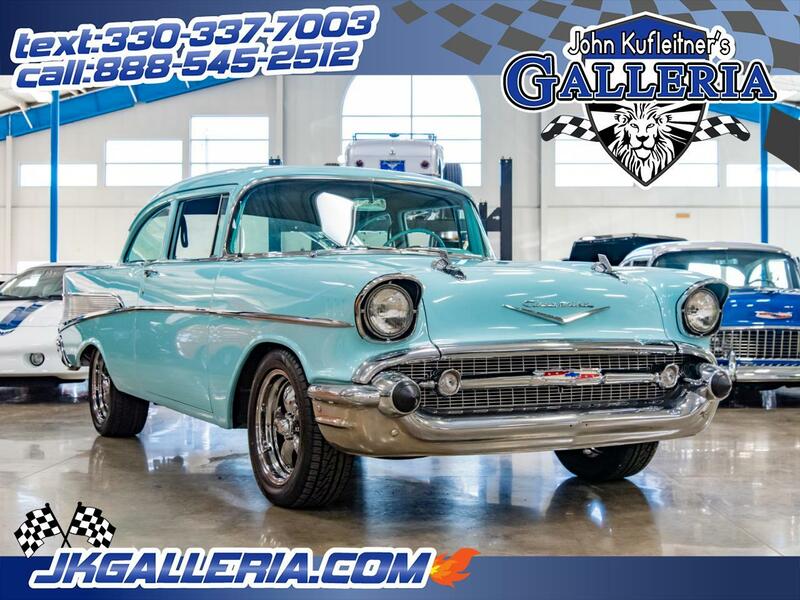 (75) Photos Printable Brochure Apply For Credit Text Us About This Vehicle! An absolutely beautifully bodied and restored 57. Dressed up with Bel-Air quarter trim, and "Old Schooled" just the way we loved them done. Previous owner bought in 2000 as a quality frame and body for restoration. Then the process began, completed in approximately 2005, engine upgrade 2009, professional done with owners assistance. New body paint, new interior, gloss black frame, new glass, new wiring, new engine, all part of this build. * Very nicely polished intake manifold from Summit Racing. * Car was painted in 2005, you can tell it was expertly prepared. It is beautifully polished, smooth, shiny, and matches all the way around and without a question is professionally done! * There is absolutely no orange peel, as it is beautifully rubbed and smooth..
* The body is almost laser straight, and had to have been extremely professionally prepared before receiving the paint. Look closely at the pictures at an angle, and you will see what I am talking about. * The fits of the doors, hood, and trunk all look fairly uniform and proper, and where expertly remounted on the car. * The owner indicated the reason he bought this car was he believed it has been out west, and believed it to have a very high quality body with minimal repair. * In going over the car with a magnetic paint gauge we would estimate that in order to make a car this beautifully straight it would have been professionally prepared. As a show car it has a good solid amount of color placed on the body to produce a beautiful finish. * We did not find any absents of steel in body panels, and would note that around the headlights, taillight, and wheel opening moldings it did not indicate typical rust repair. * The rear bottom of the front fenders is the only spot the gauge indicated some possible repair at some point. * All the bright work on the car appears to be fastened down well. * All the stainless surrounding or near the windows is all dent free and shows very little wear, but like typical few year old stainless could be polished up a step better. * The front and rear Chevrolet badging and the V below it, as well as the spears on the front, the antenna mount and door handles all look like that of almost a new car. * The rear bumper and the taillight bezels are all very shiny and reflective, but do have some light wear and scratching on the top. * All new tinted glass was installed in all windows only excluding the vent window glass, which appears to be a similar tint. * The glass does not have any noticeable logos on it with the exception of the windshield which is a LOF logo. * The glass is as new as you could imagine, as we don't see any scratches, wiper marks, cracks ext. The darker tint really looks appropriate on the green body. * Previous owner had a professional upholster install the headliner, door panels, seat covers, and carpet, and it shows no wear. * The sun visors are solid and matching headliner upholstery. * The interior all feels and looks as if it was just done. * There is a small amount of wrinkling on the headliner particularity around the hand pull straps. * The new wiring harness was installed in the car and also included is all the extra wiring, and information from American auto wire systems. It includes wiring to add in factory or even non factory options like a third light or electric fans. The remainder of the kit and the electrical connectors are included. * The trunk is painted in similar green. * Inboard springs allow accommodation of larger rear tires and wheels shall a future owner desire. * There is a spare tire, wheel, and older mat, as well as a solid floor. The spare tire cut out was removed. * Engine is a 290 H.P. / 350 C.I. General Motors long block engine, that was purchased new and installed a few years after the restoration for additional performance. * Engine was bought new from Burt Greenwald Chevrolet, in Akron, Ohio. * The engine included new block, heads, and reciprocating parts. * The bottom side of the hood has been expertly finished. * The car has a dual master cylinder, and power brakes. Items of chrome along with the chrome alternator. * The Previous owner had a completely custom fabricated aluminized steel exhaust system (dual) to the rear of the car. The turn down on the ends were made to simulate the factory pipes. * A quarts of extra touch up paint is included. * If you look at the attention to detail that went into the mounting hardware, nuts, bolts, paint quality, newer shocks, newer brakes, and inside rockers are in great condition. * The floors are all nice and solid. * The previous owner said it has some drag racing in its background, which might explains the great condition its in. Message: Thought you might be interested in this 1957 Chevrolet 210.